Weight was 180 pounds today so no change from last week. I managed to go jogging twice this week which makes me feel really good because exercise is one area that I haven’t kept up with over the last month or so. This is mainly because of a never-ending cold but I’m back on track now and I hope to run twice a week. A big congrats goes over to Keith at The Money Gardener who just had a little baby boy a couple of days ago! 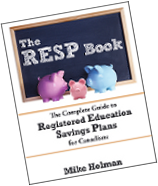 Don’t forget to enter the “RRSP Book” book giveaway – contest ends Monday at midnight! MoneyMyths hosted the Carnival of Money Stories and included my post called 2007 Investment Returns (hey you gotta enter something!). On Friday I’m going to be participating in a group writing project – “The Money Matters for All Ages” series. This is a pretty neat set of posts which deals with money matters for different ages from tiny tots all the way up to retirees. The posts which have been published this week have lots of great advice about how to teach kids (of different ages) about money. Thanks for mentioning the project! I’m loving it so far! Hey FP, congrats on the continued weight loss! No change is great! (as opposed to going up). Looking forward to the rest of the project and your post! Mike, Thanks for the link and good buy on BNS. MG – good luck with the baby!